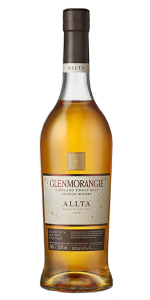 This is the tenth release in Glenmorangie’s Private Edition series, and is the most unique Glenmorangie single malt in many years. The barley for this whisky came from the Cadboll Farm near the distillery, and so did the yeast used to ferment it. Glenmorangie’s whisky-making team worked with their yeast suppliers to isolate and cultivate a unique strain of wild yeast from the farm that differs greatly from the standard “distiller’s yeast” used at Glenmorangie and many other distilleries in Scotland.